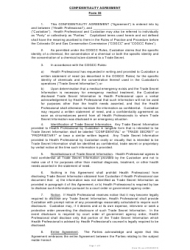 This is a Form 35 Confidentiality Agreement from Colorado between a health professional and a custodian. 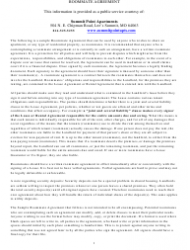 The parties agree on the confidential treatment of chemicals, to which 10 clauses of the agreement give a detailed explanation. 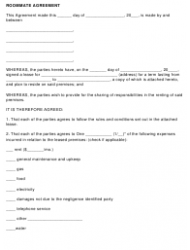 This template is used by child care facilities and is called “Confidentiality in Child Care Statement”. It protects the rights of the children that frequent this child care. 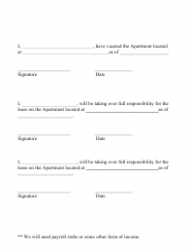 It is a simple one-page form that requires to print name, da, e and hand-signature. A non-disclosure agreement (NDA) - also called a confidentiality agreement or confidential disclosure agreement - is a legal contract between two parties that agree not to disclose information covered by the agreement. 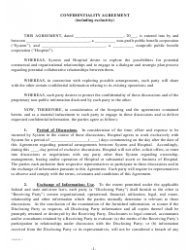 A confidentiality agreement is a legal contract between parties, where at least one of the parties expresses willingness not to disclose certain information. 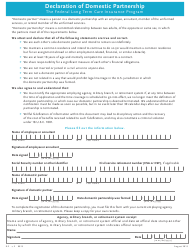 This is a three-page Volunteer Confidentiality and Non-disclosure Agreement template from an Australian volunteer organization. 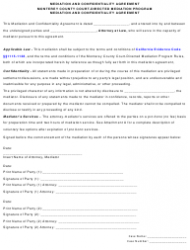 This form protects data pertaining to the clients of the body art facility. 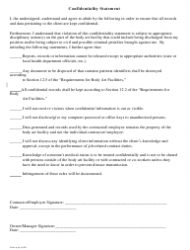 It is a one-page confidentiality statement that requires an employee’s and the owner’s signatures. 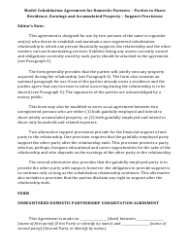 This is a model for a Cohabitation Agreement for Domestic Partners, where parties share residence, earnings, and accumulated property. 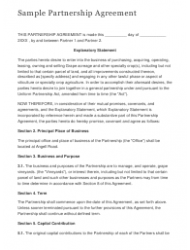 This agreement is designed for use by two persons of the same or opposite sexes. 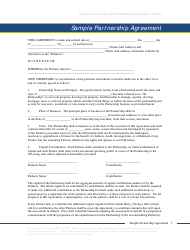 This is patient data confidentiality agreement from the Alabama Department of Public Health provides a two-page agreement relating to patients’ health information, its access and exchange. 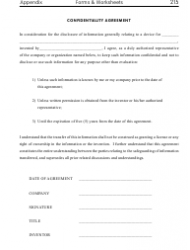 This is a two-page one-way non-disclosure agreement template between a company and a person to whom the company will disclose information. 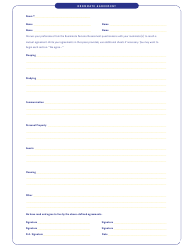 Use this form to protect sensitive information or ideas with this template. 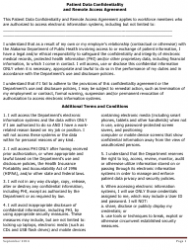 This is a one-page statement of an employee agreeing to keep their company’s information confidential. 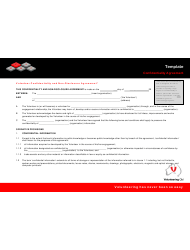 The form is filled out except for several fields such as the date, the name of the employee and the name of the company. 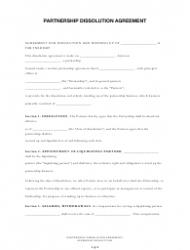 This is a sample confidentiality agreement. 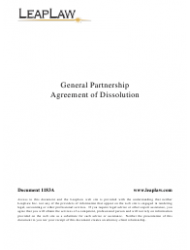 It is a two-page document that provides a confidentiality statement and several exceptions when a disclosure does not constitute a breach of confidentiality. 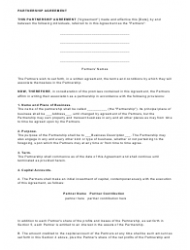 This is an agreement between a hospital and a non-profit public benefit corporation. 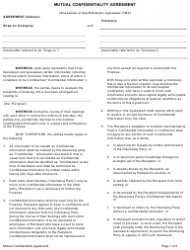 This template is appropriate for use when both parties wish to exchange confidential information. 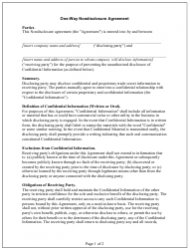 This document - the employee non-disclosure and confidentiality agreement - is a one-page template signed by an employee who agrees not to disclose the company's trade secrets. 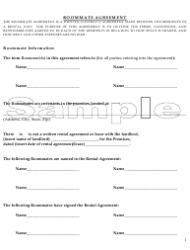 This is a Mutual Confidentiality Agreement, known also as a Non-Disclosure Agreement (NDA). 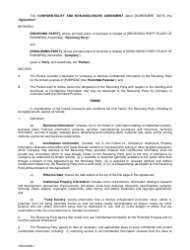 It is a three-page legal document between two companies, entering into a business arrangement. 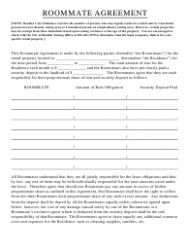 This agreement is between an attorney and client and constitutes a legal document, which creates the trust and confidence required for proper representation. It consists of two pages. 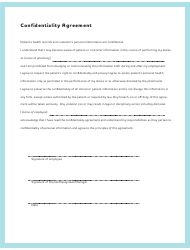 This is a one-page agreement between a pharmacy and a patient or customer. Patient’s health records and customer’s personal information are traditionally treated as confidential. 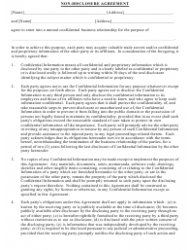 This is a three-page business confidentiality agreement. 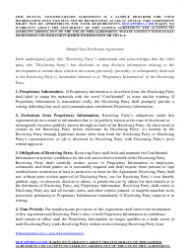 The legal document defines terms used in this agreement and specifies the receiving party’s obligation to keep the trade secrets confidential, even if acquired through a third party. 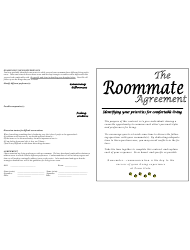 This is a short one-page Non-disclosure Agreement Template. It contains only two points, namely a statement to keep all company information in strict confidence and to disclose this information only to individuals who have signed a non-disclosure agreement with the client. 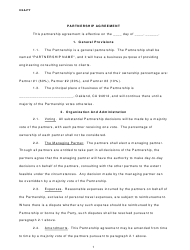 This non-disclosure agreement comes from Arizona. 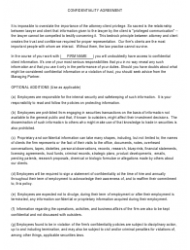 It is a general legal document that includes most common provisions that most business individuals expect to see. 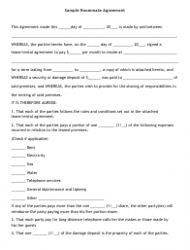 This Mediation and Confidentiality Agreement is from Monterey County, California. 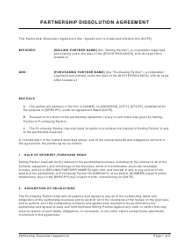 A three-page template contains a one-page attachment outlining a pro-bono statement. 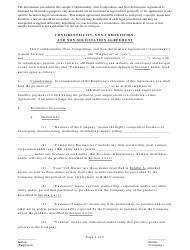 This Confidentiality, Non-Competition, and Non-Solicitation Agreement template is intended for illustrative purposes only. Do not use it to substitute legal advice or counsel. 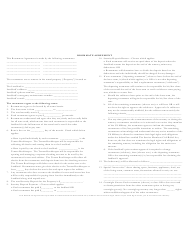 This template shows a confidentiality template between a Georgian corporation and an employee.